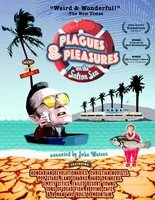 There's an amazing/horrifying/almost unbelieveable place -- California's Salton Sea and a film by Chris Metzler -- Plagues and Pleasures on the Salton Sea, that tells its story. at 7:30 pm at Studio on the Square. Admission is free (with donations accepted). The film is part history and part cautionary tale of this place once known as the "California Riviera". Created by an engineering error in 1905, reworked in the 1950s as a world class vacation destination for the rich and famous, suddenly abandoned after a series of hurricanes, floods, and fish die-offs, and finally almost saved by Congressman Sonny Bono, the Salton Sea is now a fetid, stagnant, salty lake with an undetermined future. For more information about the showing at Studio on the Square, contact Tom Lawrence at bus@thecave.com or (901) 237-4819.